We always hear about plants, both indoor and outdoor, being poisonous. I have addressed this topic in a previous blog a while ago. I recently found this article by Dennis Holley which I feel is more informative as it addresses different kinds of “poisonous”, taking into account allergies. Add this to your list of articles on poisonous plants. We can never have too much information on such an important topic. There are nearly 70,000 reported plant poisonings a year in this country on average. Plants with poisonous parts can be found in homes, flower gardens and vegetable gardens. In fact, more than 700 species of plants located in the United States and Canada have caused severe illness or death in humans. While not highly toxic except for some food allergies, other plants can cause a host of irritating problems such as respiratory allergies, contact dermatitis, and food allergies which can make life miserable. The two most frequently cited plants involved in calls to poison control centers concerning children ingesting houseplants are philodendron and dumbcane. Philodendron grow either as vines or erect plants admired for their heart-shaped leaves. The dumbcanes are distinguished by speckled leaves on a stout erect stem. If swallowed, these plants cause painful burning and swelling of the lips, tongue, mouth, and throat, which may persist for several days. Talking, swallowing, and even breathing may become labored. In fact, the difficulty in speaking after ingesting the plant accounts for its common name, dumbcane. While not strictly poisonous, certain plants or plant parts are capable of causing allergic reactions in sensitive individuals. These reactions fall into three categories: respiratory allergies, contact dermatitis, and food allergies. The pollen produced by some common weeds (especially ragweed), most grasses, and many trees can trigger allergic or hypersensitive reactions in susceptible individuals with hay fever (which has little to do with hay and seldom produces a fever) and allergic asthma the most common. The sneezing, runny nose, nasal congestion, and red, itchy, puffy eyes of hay fever or the wheezing, coughing, and choking of allergic asthma are all too familiar to many people. Approximately 20-25% of the human population suffers from one or both of these conditions, with about 50 million Americans alone so afflicted. Treatment of these conditions is a multibillion dollar a year business. Contact dermatitis is an allergic reaction of the skin to something touched. Hay fever and allergic asthma are examples of immediate hypersensitivity but contact dermatitis is considered delayed sensitivity, since symptoms may take several hours to days before they appear. Related species include poison oak, western poison oak, and poison sumac. 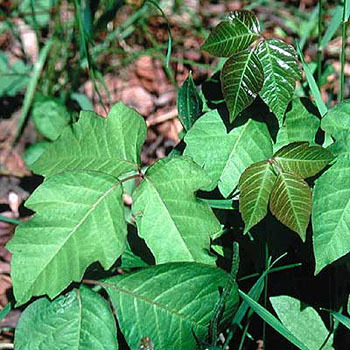 Poison oak and poison sumac are found in the East, but occur as far west as Texas, while western poison oak occurs in the Pacific coastal states. It is estimated that one out of every two people is allergic to these plants, which cause serious skin rashes on sensitive people. About 10% of the population is so sensitive that they require medical care even after a brief exposure. Contact with these plants usually results in a red swollen area appearing 24-48 hours later. The rash is followed by blisters and intense itching with symptoms lasting a week or longer. The actual allergen, known as urushiol, is a resin present in all parts of the plant. This compound is so reactive that a single drop can cause dermatitis in 500 sensitive individuals. It is also a stable, long-lasting compound. Botanists have developed dermatitis after studying dried plants over 100 years old. Inhaling smoke from burning plants can also cause massive skin rash, and seriously affect the eyes and lungs. Food allergies are sensitivities to certain foods that can cause a great diversity of symptoms in various body systems ranging from abdominal pain, vomiting, and diarrhea to hives and skin rash to asthma symptoms. The most severe result of food sensitivity is anaphylaxis, a rare and sometimes fatal reaction with multiple symptoms, including swelling of the respiratory tissues, rapid drop in blood pressure, and cardiovascular collapse. The diversity of symptoms makes food allergies difficult to diagnose and the hundreds of foods capable of triggering such allergic reactions make identifying the offending food(s) even more difficult. The principal therapy for food allergies is avoidance, which makes afflicted individuals constantly vigil about ingredients (and is why they no longer serve those little packets of peanuts or almonds on airlines). Unfortunately, while plants provide humans with food and other bountiful resources, they can also poison, cause the skin to itch and burn and cause the nose to run and the eyes to weep nearly uncontrollably.